If you’re running Windows, odds are pretty good that you’re also running Microsoft Edge, the highly capable new Web browser that (finally!) replaced Internet Explorer a few years ago. Internet Explorer was one of the most hated browsers in the history of the Internet, and for good reason, so if you’re still using MSIE, please, please upgrade to something else. You’ll thank me. 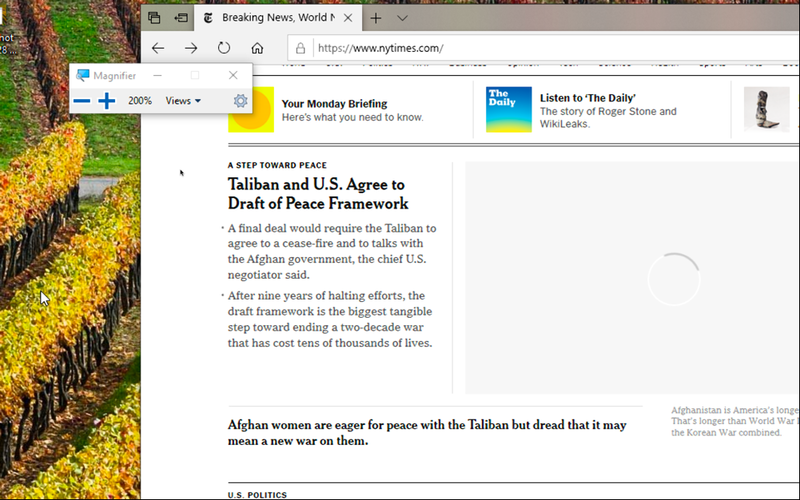 And a great choice is Microsoft Edge, as I said; it’s fast, easy, well designed, and free to download if you don’t already have it on your system. In terms of the size of text, there are a couple of ways to solve this common problem. One that’s really easy is to simply zoom in on the page while you’re in Edge or whatever other browser you prefer. Typically there are keyboard shortcuts, so that’s all you need to remember. The problem is that it can also mess with the page layout or cause you to scroll horizontal as well as vertically to read content, and that’s a pain. 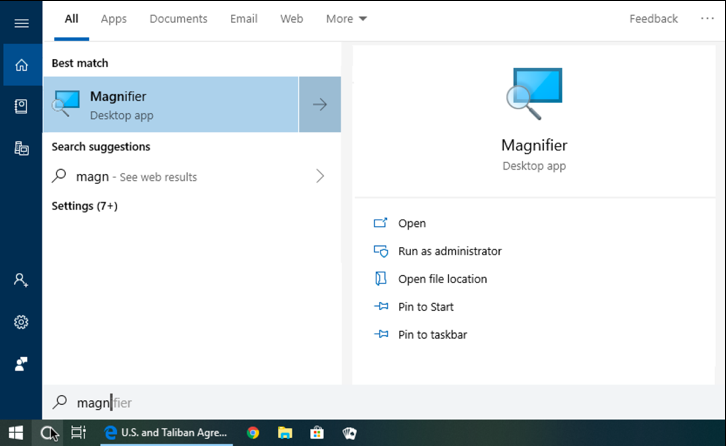 The second option is to use a great assistive technology baked into Windows called “Magnifier”, which works as a sort of digital magnifying glass on anything on the screen, whether it’s text, an image, or even the background of a photo you’re viewing. No surprise you find that text small – the page is designed to emulate the print edition, not be easy to consume on a screen. I’ve left the pop-up tip as that shows you the keyboard shortcut. Either click or tap on the “+” to zoom in everything on the page, or try the keyboard shortcut of pushing both the Control and “+” keys simultaneously. Everything gets bigger! Let’s check out the Magnifier feature too, so you can decide which you prefer. With just a little bit of experimentation, you can find the settings that are best for your needs and what’s great about Magnifier is that it works at the display driver level so it magnifies everything on the screen, whether it’s a pop-up menu, an image or even a streaming movie you’re watching from Netflix or similar. Done? Go back to the Magnifier window and choose Quit from the gear menu. 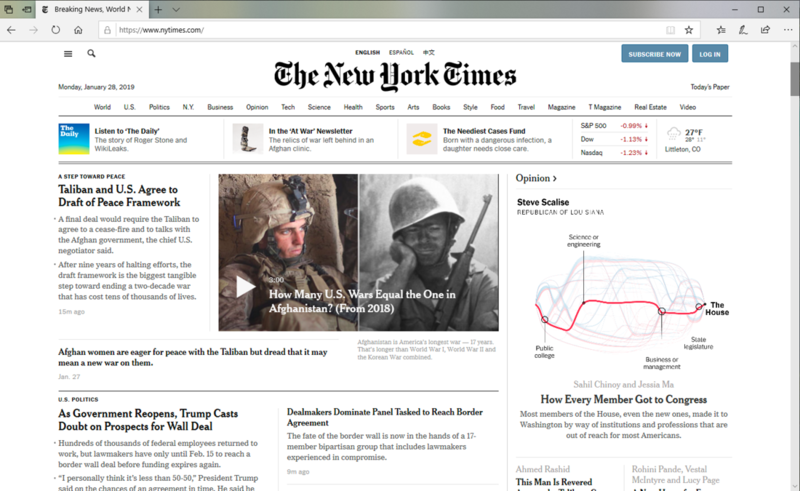 Hope that helps you more easily navigate through your Windows experience, whether it’s reading the small print on the NY Times home page or anything else online. Pro Tip: I have a ton of Windows help and tutorial content here on the site. Please take the time to check some of it out while you’re here. Thanks! I prefer to hold down the left Ctrl key and just use the mouse wheel. Ctrl+Mouse Wheel up zooms in and Ctrl+Mouse Wheel down zooms out. 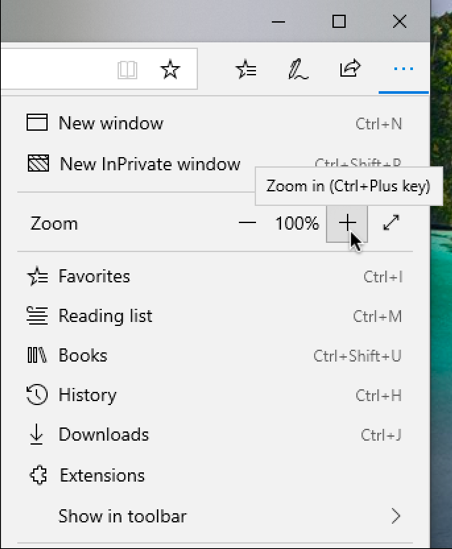 As suggested by my eye doctor (I have cataracts), just hold down the Ctrl key with your left hand on the keyboard, and use your right hand to zoom up (larger text) or down (smaller text) using the arrow keys. This is much easier for me than either of the methods you suggested above and it works with any web browser I use and with my Thunderbird email client.